There’s a bewildering array of Champagnes available, and then there’s an extra complication of the price discounts and offers that make it difficult to work out what price you should be paying. 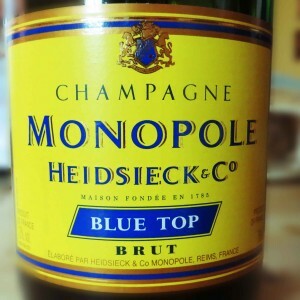 Heidsieck Monopole Blue Top is often in those offers. I was rather put off this wine because it had a weird wetsuit on it, a thin neoprene style wrapper for keeping the wine cool outside the fridge. It had fireworks painted on it. All very odd. I threw the creepy cover out so it was just back to being a bottle of Champagne. Monopole tend to go for a blanc de noirs style, with Pinot Noir and Pinot Meunier, without Chardonnay. That gives it a slightly fruitier zing, in this case more redcurrant than strawberry, but perfectly nice. There’s something bready too. Not toast or brioche, but bread. I picked this Blue Top Monopole up for £15. You might see it priced anywhere from £15 to £30. You can work up the “tops”. Gold top is nicer and again, you can get that for £30, or £25 or more. Try Bronze Top for something in the middle, somewhere around £20, or £25. Try Majestic for a reasonably low and stable price point, but look out in Supermarkets around Champagne swigging holidays.